What is it that comes to your mind when you are out in the open and you look up and behold a large eagle soaring high above with its majestic wings spread? "Wish I could fly! ", right? Paragliding or sailing-in-the-air is man's closest answer to that dream he nurtured since ages. Thrilling, true, but not everybody can be a paraglider. They say, "There are no old and bold pilots," which means only lucky ones live to grow old. This isn't meant to scare you, but to say that it needs a lion's heart to be able to fly high up in the sky - like a bird. The sheer magnanimity of Himalayan mountain ranges engulfs in it a pulsating world of adventure sports. Skiing, mountaineering, rock climbing, trekking, paragliding - you name it. Sandwiched between the steep cliffs of the Himalayas and the plains of Terai, is Garhwal - the Paraglider's 'paradise' - an appelletion linked to its unique topography and the fact that the hot air from the Gangetic plains and the cold from the hills create splendid flying conditions. September to December and March to June is when you should be visiting. The Doon Valley roosted between the Himalayas and the Shiwaliks and frilled with the Ganga and the Yamuna is another posizione perfetta for Aero Sports. 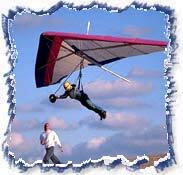 There is the GMVN Aerosports Centre that also offers paragliding courses. Professional and amateur para/ hang gliders flock to the Kangra Valley's Billing (8,500 feet) for the annual paragliding competition. Dhauladhar range at 20,000 feet and the Kangra Valley below create an ideal location for high altitude and cross-country gliding. The season here is between April to June and September to November, at the onset and tail end of the southeast monsoons when winds are constant and hopefully not too wet. India's coastline flanked on both sides by the rugged hill ranges of Eastern and Western Ghats form a classic paragliding zone with smooth laminar sea breeze that gently creep up the ghats creating magical lift bands that get the pilot gliding for a long time. 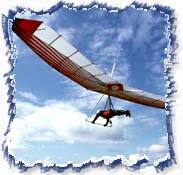 Gliders take off from the cliffs at Goa, Ratnagiri and other seaside hamlets. Italian hang-glider Angelo d'Arrigo - committed to conserving avifauna - glided over the Sahara and the Mediterranean in free flight without using an engine by following the desert hawks, crossed Siberia with Siberian cranes and, more recently, in May 2004 flew over Mount Everest, the highest mountain in the world, with Himalayan eagles. Petrifying! The current paragliding world record, was set by Canadian William Gadd who flew 263 miles in 10 ½ hours in the United States. If you do not weigh anything between 45 - 85 kgs, you are not qualified for the flight. Hypsiphobics (those with a fear of height) are strict 'No-Nos'. Nelly Furtado's, "I'm like a bird, I'll only fly away, I don't know where my soul is, I don't know where my home is," - can be a perfect humming number for the gliders.